My grandfather often said, “all work that’s honest work is good work,” and many of us grew up hearing similar expressions celebrating the importance and dignity of work. However, I think Owens’ message resonated so widely because our nation is in the midst of a major economic shift that’s transforming the future of employment and job creation in real time. Instead of relying on a one-size-fits-all model where success is defined by earning a liberal arts degree, we must accurately adjust educational curriculum to provide more choices and options for students. Last year, Georgia also launched a statewide partnership with YouScience to offer all middle and high school students access to an extremely innovative aptitude-based career guidance program. YouScience utilizes proven algorithms to generate personalized results, guiding students to make more informed postsecondary and career choices. Beyond simply preparing our students with the skills and training to be successful in high-demand careers, this program allows each school’s faculty to engage students in making proactive choices that will maximize the value of their education. More importantly, thousands of high school students are graduating each year with associate degrees, industry certifications, and employment experience in skilled professions. 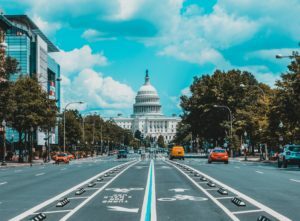 Our nation is at a pivotal point in which we will have the opportunity to fuel unprecedented growth, innovation, and prosperity that addresses the greatest challenges facing our communities. However, to take full advantage of this moment in history, it’s vital that industry and business step forward as partners with our public schools to meet the evolving needs of the 21st-century economy. This post is written by Former Lt. Governor Casey Cagle in conjunction with YouScience, a Platinum Level sponsor of the 2019 Advance CTE Spring Meeting. This post is written by Fleck Education, a Platinum Level sponsor of the 2019 Advance CTE Spring Meeting. That sentiment makes sense: change is difficult. Being nimble and adaptable – the soft-skills we teach to our students – can be tough to put into actual practice. The biggest fear appears to be the “risk” of opening up local CTE programs of study to the opinions – and possible misunderstandings – of local employers, parents, leaders and community members. Maybe they’ll tell us how we should or shouldn’t fund our programs or think CTE is less rigorous than traditional school programs. The reality is that all of us working with CTE already face these misconceptions on a daily basis, whether expressed verbally or not. The majority of people living in our communities have only a fuzzy understanding of CTE. A potential benefit of the local needs assessment requirement is that many of these same community individuals will be invited to attend meetings where they will discover CTE’s amazing graduation rates, career readiness programs, and how CTE impacts students lives. When these local needs assessment meetings occur, it is likely you will hear misunderstandings and misgivings loud and clear. However, the meetings will also provide the opportunity to correct misinformation and present the full picture of CTE, along with data that shows what’s working well and the challenges that lie ahead. They’ll hear touching CTE student success stories and can reflect on how the obstacles are not just CTE challenges but also a community responsibility. By being at the table, stakeholders at your local needs assessment convenings will deepen their understanding of CTE and come to recognize their role in the support and ultimate success of CTE in your community. The Usual. Often, but not always, the “usual” is that employer who says “All I need are employees who show up for work on time, every day, and pass a drug test.” Or “Just get them to me and I’ll teach them everything they need to know.” Be empathetic and suggest that they would be an ideal member of a task force to study this issue further. At some point, when it doesn’t come across as confrontational, reiterate CTE’s purpose of preparing students for the multitude of careers they may have in their futures, not just the skills for one specific job. The Misinformed. Some individuals still believe the only pathway to success is a traditional four year college degree leading to a white collar occupation. Anything else is setting students up for a life of disappointment. While it may be subtle, you’ll recognize their bias. These individuals typically come around when they review actual salary data and career satisfaction reports and meet students and adults who have succeeded through a variety of alternative pathways. For all of these individuals, and for some of us too, the new local needs assessment mandate will require us to change our thinking and how we do things. It may be uncomfortable at first and will undoubtedly be tough. But it will also be an opportunity to substantially build the reputation, the quality and the overall success of our local and state CTE programs. Thomas Edison said, “Opportunity is missed by most because it is dressed in overalls and looks like work.” When we look past the hard work the new local needs assessment requires, I believe we will uncover a significant opportunity to further enhance the value of CTE in our communities. 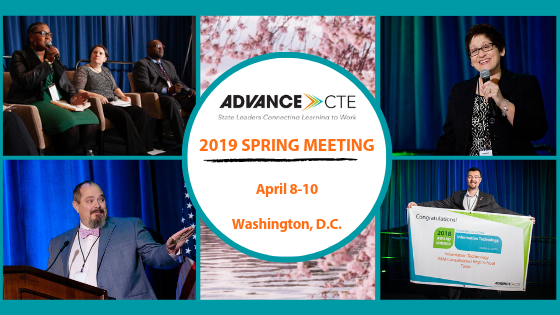 Posted in Advance CTE Spring Meeting | Comments Off on 2019 Spring Meeting Registration is Now Open! Advance CTE’s annual Excellence in Action award recognizes and honors superior Career Technical Education (CTE) programs of study from across the nation. Do you think you have one of the best CTE programs of study? Apply for the 2019 Excellence in Action award to showcase the amazing work of your learners, instructors, partners and faculty at the national level. The application submission deadline is November 21, 2018. Join us for a webinar on November 1, 2018 from 2 p.m. to 3 p.m. EST to learn all about the application process from Advance CTE staff. 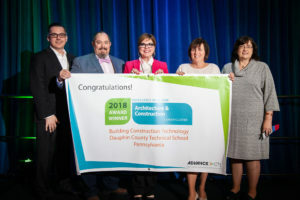 You will also hear from a 2018 award winner, the Building Construction Technology program of study at the Dauphin County Technical School in Pennsylvania. Learn more about what makes an award-winning program and get tips on how to fill out your application directly from an award winner. Register Today! 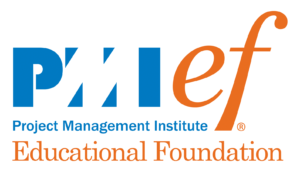 This post is written by PMIEF, a Platinum Level sponsor of the 2018 Advance CTE Fall Meeting. Learning how to utilize their own interests and passions to grow their skills? Mastering core academic content that is relevant to the challenges of their future careers? Collaborating with others; learning complex skills and behaviors needed to successfully complete projects likely encountered in college, universities, and especially in the workplace? Most young people will manage projects every day for the rest of their personal and professional lives. Applying project management methodology in the classroom offers students rich opportunities to learn how to manage and lead effective projects, hone a variety of essential 21st century skills, apply these skills to deepen their subject-matter knowledge, and reduce the talent gap. If we want to empower the millions of students for whom college is not a given or those without access to a quality education, then consider project management and the big picture: projects aren’t the big picture or an end result – they’re part of the picture itself and project management provides a standard framework for consistently doing projects well. To learn more about changing the way children learn, live, and plan for the future through the knowledge and application of project management, visit PMI’s Educational Foundation (PMIEF)or visit our booth at the 2018 Advance CTE Fall Meeting.